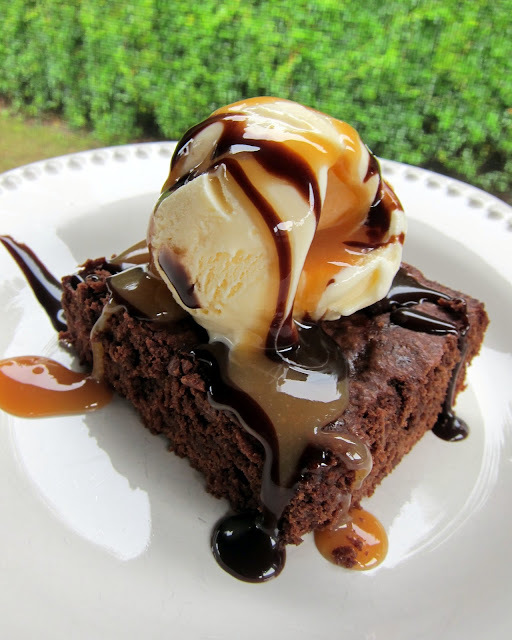 Brownies are one of my favorite desserts. I especially love them topped with vanilla ice cream. I got crazy this time and added caramel and chocolate sauce! YUM! This recipe is from one of my favorite cookbooks - The Fat Witch Bakery. I've made several of their recipes and they never disappoint! This brownie recipe was super easy. They reminded me of the brownies I used to make as a child with my Mom. These were very moist and perfectly chocolatey! Preheat oven to 350. Grease and flour a 9-inch baking pan. Set aside. In a small saucepan, heat butter over high heat until it is melted. Remove from heat and let cool for 5 minutes. Whisk in the cocoa powder and sugar into the butter until well blended. Add the eggs one at a time, whisking after each until the mixture is smooth and shiny. Whisk in the vanilla. Sift flour and salt into the batter. Mix until well combined and no trace of the dry ingredients remain. Spread the batter evenly in the prepared pan and bake for 30 minutes or until a toothpick inserted in the center comes out clean or with only crumbs. Allow to cool 1 hour. Que rrrrrrrrrrico! Socorro la figura del bikini la veo en peligro, con esa receta de chuparse los dedos! What a delicious looking photo! I need to make these soon. can u use regular flour? Yum! I had to Pin this - it's so irresistible.